Glucose ( or , also known as dextrose, or grape sugar) is a simple aldosic monosaccharide found in plants. It is a monosaccharide that is absorbed directly into the bloodstream during digestion. It is an important carbohydrate in biology, which is indicated by the fact that cells use it as a secondary source of energy and a metabolic intermediate. Glucose is one of the main products of photosynthesis and fuels for cellular respiration. Like all hexoses, glucose has the molecular formula C6H12O6. It has fifteen stereoisomers called aldohexoses that differ from it only by swapping the positions of the two substituents (-H and -OH) at one or more of four chiral centers (the four carbons at the center of the molecule). When all four chiral centers are altered, the result is a mirror image of the original molecule that has similar chemical properties; however, the interaction of this with other compounds, as in the body, is very different. Only one of the two mirrored forms, called D-glucose, is generally encountered in nature. Like all aldohexoses, glucose also has a more diverse set of structural isomers, including a broader set of hexoses and inositols. However - unlike any of the stereoisomers - a few structural isomers, the ring-shaped glucopyranoses and glucofuranoses, are rapidly produced and continually interconvert whenever glucose is dissolved in water, though they can be crystallized as separate compounds. Because these were described long after glucose had been identified, they are usually called cyclic forms of glucose. The open chain form of glucose, with systematic name (2R,3S,4R,5R)-2,3,4,5,6-Pentahydroxyhexanal, contains the free reactive aldehyde that makes glucose a reducing sugar and mediates these reactions. The chemical D-glucose is sometimes referred to as dextrose, a historical name that derives from dextrorotatory glucose because a solution of D-glucose in water rotates the plane of polarized light to the right (dextro). However, the D- in D-glucose refers to a chiral chemical similarity property in sugars, not the property of rotating light (for example, D-fructose rotates light to the left). For this reason, the D- and L- designations in sugars do not perfectly predict optical rotation, and do not refer to this property. Starch and cellulose are polymers derived from the dehydration of D-glucose. The other stereoisomer, called L-glucose, is rarely found in nature. 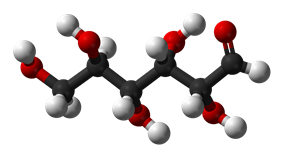 The name "glucose" comes from the Greek word γλευχος, meaning "sweet wine, must". The suffix "-ose" denotes a sugar. It is unclear why glucose, as opposed to other amino groups of proteins. This reaction - glycation - impairs or destroys the function of many enzymes. The low rate of glycation is due to glucose's stability in the cyclic isomer state, which is less reactive than other hexose isomers . Nevertheless, many of the long-term complications of diabetes (e.g., blindness, renal failure, and peripheral neuropathy) are probably due to the glycation of proteins or lipids. In contrast, enzyme-regulated addition of glucose by glycosylation is essential to the function of many proteins. Another possible explanation for the widespread use of glucose is that it is the most conformationally stable compared to other possibilities . Glucose is a common medical analyte measured in blood samples. Eating or fasting prior to taking a blood sample has an effect on the result. A high fasting glucose blood sugar level may be a sign of prediabetes or diabetes mellitus. Glucose is a ubiquitous fuel in aerobic respiration, anaerobic respiration, or fermentation. Glucose is the human body's key source of energy, through aerobic respiration, providing about 3.75 kilocalories (16 kilojoules) of food energy per gram. Breakdown of carbohydrates (e.g. starch) yields mono- and disaccharides, most of which is glucose. Through glycolysis and later in the reactions of the citric acid cycle, glucose is oxidized to eventually form CO2 and water, yielding energy mostly in the form of ATP. The insulin reaction, and other mechanisms, regulate the concentration of glucose in the blood. Glucose is a primary source of energy for the brain, so its availability influences psychological processes. When glucose is low, psychological processes requiring mental effort (e.g., self-control, effortful decision-making) are impaired. Compound C00031 at KEGG Pathway Database. Enzyme 2.7.1.1 at KEGG Pathway Database. Compound C00668 at KEGG Pathway Database. Reaction R01786 at KEGG Pathway Database. Glucose-containing compounds and isomeric forms are digested and taken up by the body in the intestines, including starch, glycogen, disaccharides and monosaccharides. Glucose is stored in mainly the liver and muscles as glycogen. It is distributed and used in tissues as free glucose. Use of glucose as an energy source in cells is by aerobic respiration or anaerobic respiration. Both start with the early steps of the glycolysis metabolic pathway. The first step of this is the phosphorylation of glucose by hexokinase to prepare it for later breakdown to provide energy. The major reason for the immediate phosphorylation of glucose by a hexokinase is to prevent diffusion out of the cell. The phosphorylation adds a charged phosphate group so the glucose 6-phosphate cannot easily cross the cell membrane. Irreversible first steps of a metabolic pathway are common for regulatory purposes. In anaerobic respiration, one glucose molecule produces a net gain of two ATP molecules (four ATP molecules are produced during glycolysis, but two are required by enzymes used during the process). In aerobic respiration, a molecule of glucose is much more profitable in that a net worth of 32 ATP molecules is generated (34 gross with two being required in the process). Organisms use glucose as a precursor for the synthesis of several important substances. Starch, cellulose, and glycogen ("animal starch") are common glucose polymers (polysaccharides). Some of these polymers (starch or glycogen) serve as energy stores, while others (cellulose and chitin, which is made from a derivative of glucose) have structural roles. Oligosaccharides of glucose combined with other sugars serve as important energy stores. These include lactose, the predominant sugar in milk, which is a glucose-galactose disaccharide, and sucrose, another disaccharide of glucose and fructose. Glucose is also added onto certain proteins and lipids in a process called glycosylation. This is often critical for their functioning. 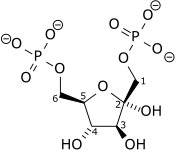 The enzymes that join glucose to other molecules usually use phosphorylated glucose to power the formation of the new bond by breaking the glucose-phosphate bond. Other than its direct use as a monomer, glucose can be broken down to synthesize a wide variety of other biomolecules. This is important, as glucose serves both as a primary store of energy and as a source of organic carbon. Glucose can be broken down and converted into lipids. It is also a precursor for the synthesis of other important molecules such as vitamin C (ascorbic acid). Though plants and some microbes can create all the compounds they need from glucose given the necessary minerals, animals and many microbes cannot synthesize the necessary compounds and thus have to obtain them from an external source, such as diet. Glucose is a monosaccharide with formula C6H12O6 or H-(C=O)-(CHOH)5-H, whose five hydroxyl (OH) groups are arranged in a specific way along its six-carbon back. In its fleeting open-chain form, the glucose molecule has an open (as opposed to cyclic) and unbranched backbone of six carbon atoms, C-1 through C-6; where C-1 is part of an aldehyde group H(C=O)-, and each of the other five carbons bears one hydroxyl group -OH. The remaining bonds of the backbone carbons are satisfied by hydrogen atoms -H. Therefore glucose is both a hexose and an aldose, or an aldohexose.The aldehyde group makes glucose a reducing sugar giving a positive reaction with the Fehling test. Each of the four carbons C-2 through C-5 is a stereocenter, meaning that its four bonds connect to four different substitutents. (Carbon C-2, for example, connects to -(C=O)H, -OH, -H, and -(CHOH)4H.) In D-glucose, these four parts must be in a specific three-dimensional arrangement. Namely, when the molecule is drawn in the Fischer projection, the hydroxyls on C-2, C-4, and C-5 must be on the right side, while that on C-3 must be on the left side. The positions of those four hydroxyls are exactly reversed in the Fischer diagram of L-glucose. D- and L-glucose are two of the 16 possible aldohexoses; the other 14 are allose, altrose, mannose, gulose, idose, galactose, and talose, each with two enantiomers, "D-" and "L-". In solutions, the open-chain form of glucose (either "D-" or "L-") exists in equilibrium with several cyclic isomers, each containing a ring of carbons closed by one oxygen atom. In aqueous solution however, more than 99% of glucose molecules, at any given time, exist as pyranose. The open-chain form is limited to about 0.25% and furanose exists in negligible amounts. The terms "glucose" and "D-glucose" are generally used for these cyclic forms as well. The ring arises from the open-chain form by a nucleophilic addition reaction between the aldehyde group -(C=O)H at C-1 and the hydroxyl group -OH at C-4 or C-5, yielding a hemiacetal group -C(OH)H-O-. The reaction between C-1 and C-5 creates a molecule with a six-membered ring, called pyranose, after the cyclic ether pyran, the simplest molecule with the same carbon-oxygen ring. The (much rarer) reaction between C-1 and C-4 creates a molecule with a five-membered ring, called furanose, after the cyclic ether furan. In either case, each carbon in the ring has one hydrogen and one hydroxyl attached, except for the last carbon (C-4 or C-5) where the hydroxyl is replaced by the remainder of the open molecule (which is -(C(CH2OH)HOH)-H or -(CHOH)-H, respectively). The ring-closing reaction makes carbon C-1 chiral, too, since its four bonds lead to -H, to -OH, to carbon C-2, and to the ring oxygen. These four parts of the molecule may be arranged around C-1 (the anomeric carbon) in two distinct ways, designated by the prefixes "α-" and "β-". When a glucopyranose molecule is drawn in the Haworth projection, the designation "α-" means that the hydroxyl group attached to C-1 and the -CH2OH group at C-5 lies on opposite sides of the ring's plane (a trans arrangement), while "β-" means that they are on the same side of the plane (a cis arrangement). Therefore, the open-chain isomer D-glucose gives rise to four distinct cyclic isomers: α-D-glucopyranose, β-D-glucopyranose, α-D-glucofuranose, and β-D-glucofuranose. These are all chiral. The other open-chain isomer L-glucose similarly gives rise to four distinct cyclic forms of L-glucose, each the mirror image of the corresponding D-glucose. The rings are not planar, but are twisted in three dimensions. The glucopyranose ring (α or β) can assume several non-planar shapes, analogous to the "chair" and "boat" conformations of cyclohexane. Similarly, the glucofuranose ring may assume several shapes, analogous to the "envelope" conformations of cyclopentane. The glucopyranose forms of glucose predominate in solution, and are the only forms observed in the solid state. They are crystalline colorless solids, highly soluble in water and acetic acid, poorly soluble in methanol and ethanol. They melt at 146 °C (295 °F) (α) and 150 °C (302 °F) (β), and decompose at higher temperatures into carbon and water. Each glucose isomer is subject to rotational isomerism. Within the cyclic form of glucose, rotation may occur around the O6-C6-C5-O5 torsion angle, termed the ω-angle, to form three staggered rotamer conformations called gauche-gauche (gg), gauche-trans (gt) and trans-gauche (tg). For methyl α-D-glucopyranose at equilibrium the ratio of molecules in each rotamer conformation is reported as 57:38:5 gg:gt:tg. This tendency for the ω-angle to prefer to adopt a gauche conformation is attributed to the gauche effect. All forms of glucose are colorless and easily soluble in water, acetic acid, and several other solvents. They are only sparingly soluble in methanol and ethanol. The open-chain form is thermodynamically unstable, and it spontaneously isomerizes to the cyclic forms. (Although the ring closure reaction could in theory create four- or three-atom rings, these would be highly strained and are not observed.) In solutions at room temperature, the four cyclic isomers interconvert over a time scale of hours, in a process called mutarotation. Starting from any proportions, the mixture converges to a stable ratio of α:β 36:64. The ratio would be α:β 11:89 if it were not for the influence of the anomeric effect. Mutarotation is considerably slower at temperatures close to 0 °C. Mutarotation consists of a temporary reversal of the ring-forming reaction, resulting in the open-chain form, followed by a reforming of the ring. The ring closure step may use a different -OH group than the one recreated by the opening step (thus switching between pyranose and furanose forms), and/or the new hemiacetal group created on C-1 may have the same or opposite handedness as the original one (thus switching between the α and β forms). Thus, though the open-chain form is barely detectable in solution, it is an essential component of the equilibrium. Depending on conditions, three major solid forms of glucose can be crystallised from water solutions: α-glucopyranose, β-glucopyranose, and β-glucopyranose hydrate. Whether in water or in the solid form, D-glucose is dextrorotatory, meaning it will rotate the direction of polarized light clockwise. The effect is due to the chirality of the molecules, and indeed the mirror-image isomer, L-glucose, is levorotatory (rotates polarized light counterclockwise) by the same amount. The strength of the effect is different for each of the five tautomers. Note that the D- prefix does not refer directly to the optical properties of the compound. It indicates that the C-2 chiral center has the same handedness as that of D-glyceraldehyde (which was so labeled because it is dextrorotatory). The fact that D-glucose is dextrorotatory is a combined effect of its four chiral centers, not just of C-2; and indeed some of the other D-aldohexoses are levorotatory. Glucose physical and chemical properties have been used to build a computational model of protein-glucose binding-sites. In plants and some prokaryotes, glucose is a product of photosynthesis. In animals and fungi, glucose results from the breakdown of glycogen, a process known as glycogenolysis. In plants the breakdown substrate is starch. In animals, glucose is synthesized in the liver and kidneys from non-carbohydrate intermediates, such as pyruvate, lactate and glycerol, by a process known as gluconeogenesis. In some deep-sea bacteria, glucose is produced by chemosynthesis. 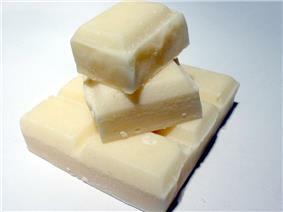 Glucose is produced commercially via the enzymatic hydrolysis of starch. Many crops can be used as the source of starch. Maize, rice, wheat, cassava, corn husk and sago are all used in various parts of the world. In the United States, corn starch (from maize) is used almost exclusively. Most commercial glucose occurs as a component of invert sugar, a roughly 1:1 mixture of glucose and fructose. In principle, cellulose could be hydrolysed to glucose, but this process is not yet commercially practical. Glucose has approximately 75 % the sweetness of sucrose (table sugar). Most dietary carbohydrates contain glucose, either as their only building block, as in starch and glycogen, or together with another monosaccharide, as in sucrose and lactose. In the lumen of the duodenum and small intestine, the glucose oligo- and polysaccharides are broken down to monosaccharides by the pancreatic and intestinal glycosidases. Other polysaccharides cannot be processed by the human intestine and require assistance by intestinal flora if they are to be broken down; the most notable exceptions are sucrose (fructose-glucose) and lactose (galactose-glucose). Glucose is then transported across the apical membrane of the enterocytes by SLC5A1 (SGLT1), and later across their basal membrane by SLC2A2 (GLUT2). Some of the glucose is converted to lactic acid by astrocytes, which is then utilized as an energy source by brain cells, some of the glucose is used by intestinal cells and red blood cells, while the rest reaches the liver, adipose tissue and muscle cells, where it is absorbed and stored as glycogen (under the influence of insulin). Liver cell glycogen can be converted to glucose and returned to the blood when insulin is low or absent; muscle cell glycogen is not returned to the blood because of a lack of enzymes. In fat cells, glucose is used to power reactions that synthesize some fat types and have other purposes. Glycogen is the body's "glucose energy storage" mechanism, because it is much more "space efficient" and less reactive than glucose itself. Individuals with diabetes or other conditions where hypoglycemia (low blood sugar) may occur often carry small amounts of sugar in various forms. One sugar commonly used is glucose, often in the form of glucose tablets (glucose pressed into a tablet shape sometimes with one or more other ingredients as a binder). Glucose was first isolated (from raisins) in 1747 by the German chemist Jacobus Henricus van't Hoff's theories of chemical kinetics and the arrangements of chemical bonds in carbon-bearing molecules. Between 1891 and 1894, Fischer established the stereochemical configuration of all the known sugars and correctly predicted the possible isomers, applying van't Hoff's theory of asymmetrical carbon atoms. ^ a b Boerio-Goates, Juliana (1991), "Heat-capacity measurements and thermodynamic functions of crystalline α-D-glucose at temperatures from 10K to 340K", J. Chem. Thermodynam. 23 (5): 403–9, . ^ Ponomarev, V. V.; Migarskaya, L. B. (1960), "Heats of combustion of some amino-acids", Russ. J. Phys. Chem. (Engl. Transl.) 34: 1182–83 . ^ "dextrose", Merriam-Webster Online Dictionary, retrieved 2009-09-02 . ^ "Chapter 3: Calculation of the Energy Content of Foods – Energy Conversion Factors", Food energy — methods of analysis and conversion factors, FAO Food and Nutrition Paper 77, Rome: Food and Agriculture Organization, 2003, . ^ Fairclough, Stephen H.; Houston, Kim (2004), "A metabolic measure of mental effort", Biol. Psychol. 66 (2): 177–90, . ^ Gailliot, Matthew T.; Baumeister, Roy F.; DeWall, C. Nathan; Plant, E. Ashby; Brewer, Lauren E.; Schmeichel, Brandon J.; Tice, Dianne M.; Maner, Jon K. (2007), "Self-Control Relies on Glucose as a Limited Energy Source: Willpower is More than a Metaphor", J. Personal. Soc. Psychol. 92 (2): 325–36, . ^ Gailliot, Matthew T.; Baumeister, Roy F. (2007), "The Physiology of Willpower: Linking Blood Glucose to Self-Control", Personal. Soc. Psychol. Rev. 11 (4): 303–27, . ^ Masicampo, E. J.; Baumeister, Roy F. (2008), "Toward a Physiology of Dual-Process Reasoning and Judgment: Lemonade, Willpower, and Expensive Rule-Based Analysis", Psychol. Sci. 19 (3): 255–60, . ^ Juaristi, Eusebio; Cuevas, Gabriel (1995), The Anomeric Effect, CRC Press, pp. 9–10, . ^ Nassif, Houssam; Al-Ali, Hassan; Khuri, Sawsan; Keyrouz, Walid (2009). "Prediction of Protein-Glucose Binding Sites Using Support Vector Machines". Proteins: Structure, Function and Bioinformatics 77 (7): 121–132. ^ Ferraris, Ronaldo P. (2001), "Dietary and developmental regulation of intestinal sugar transport", Biochem. J. 360 (Pt 2): 265–76, . ^ Emil Fischer, Nobel Foundation, retrieved 2009-09-02 . ^ Fraser-Reid, Bert, "van't Hoff's Glucose", Chem. Eng. News 77 (39): 8 .